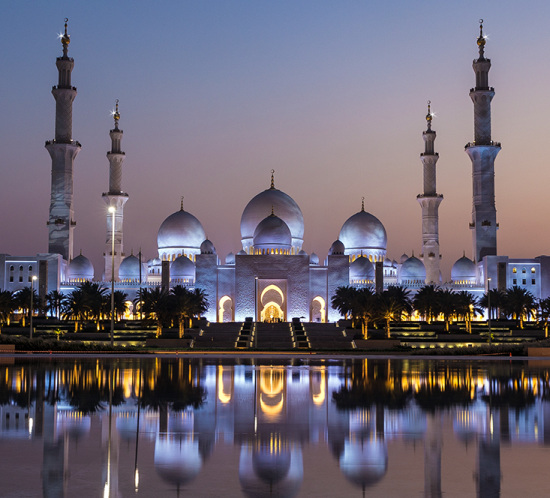 ABU DHABI, UAE, Nov. 23, 2018 /PRNewswire/ -- As Chair of the Anti-Illicit Trade & Brand Protection Summit in Abu Dhabi, United Arab Emirates (UAE), David M. Luna, President and CEO, Luna Global Networks & Convergence Strategies LLC underscored how global illicit trade threatens the economic and national security of countries all around the world. 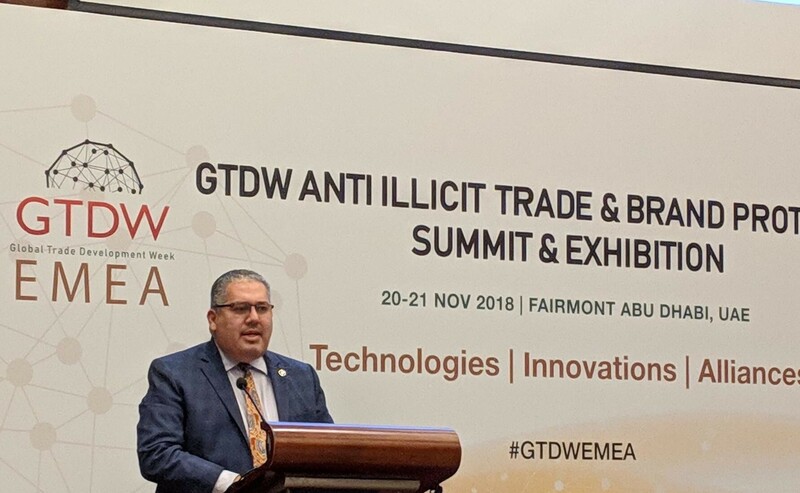 Attending the Global Trade Development Week (GTDW) event on Nov. 20-21 in UAE, Mr. Luna underscored how illicit trade is a threat multiplier that can impede the international community's collective efforts to fight corruption, organized crime, and terrorism. In attendance and providing keynotes were His Excellency Sultan bin Saeed Al Mansoori, Minister of Economy, UAE; H.E. Secretary-General Dr. Mukhisa Kituyi, United Nations Conference on Trade and Development (UNCTAD); Malek Hannouf, Chairman, Gulf Brand Owners Protection Group, (BPG), and Head of Intellectual Property Department, Middle East & Africa, Louis Vuitton (LV); and Tarkan Demirbas, Vice President for Middle East, Philip Morris International (PMI). 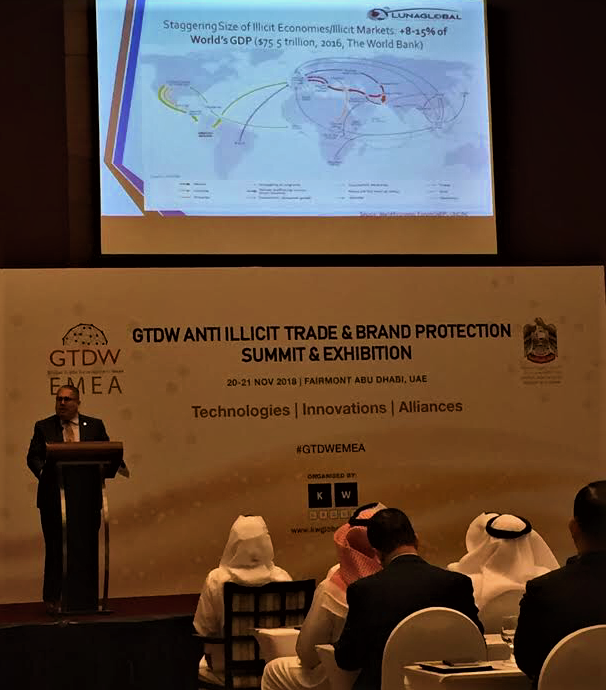 Chris Clague, Managing Editor, and Global Editorial Leader, Trade and Globalization, The Economist Intelligence Unit (EIU) and Jeff Hardy, Director-General, Transnational Alliance to Combat Illicit Trade (TRACIT) also participated at the GTDW conference and briefed on the 2018 Global Illicit Trade Environment Index and specific policy recommendations related to the UAE market. At the inaugural GTDW Anti-Illicit Trade workshop in Shanghai, China in July 2018, Luna Global Networks was proud to work with numerous partners from across the public and private sectors to launch an Anti-Illicit Trade Alliance, to strengthen networks and find innovative ways to help protect our economies, markets, and communities against the harms and impacts posed by the global illegal economy. Since that time, Luna Global Networks has continued to work with many champions across regions, sectors, and industries to harness the requisite energies to strengthen cross-border cooperation to address today's fundamental transformation of illicit trade, through a network of networks where dynamic collaborations, strategic alliances, and collective action are helping to elevate the shared global resolve to more effectively combat illicit markets. "For the reality is that no one economy or industry is immune from illicit trade and convergence crime," said Mr. Luna. Numerous international organizations have estimated that today's global illicit markets, and various forms of "convergence crime", account for several trillions of US dollars every year, to include the trafficking of drugs, humans, arms, counterfeit and pirated goods, illegal cigarettes and alcohol products, endangered wildlife, pillaged natural resources, and many other illicit commodities, corrupt proceeds and illicit financial flows. "This is simply a staggering amount and a menacing threat to our public health and safety," emphasized Mr. Luna. Fake water (bottles) and foodstuff add a heightened public human security dimension, as do counterfeit medicines, auto parts, and other illegal fast-moving consumer goods (FMCG) that are toxic and deadly. "Of equal concern is not only the current breadth and scale of today's illicit markets, but that many of them will double within five years' time alone, and the fact that criminals are diversifying their illicit portfolio to finance other threats," stated Mr. Luna. Building on the leadership and work of the Organization for Economic Cooperation and Development (OECD) and its Task Force on Countering Illicit Trade, in a 2017 report by the International Chamber of Commerce's Business Action to Stop Counterfeiting and Piracy (BASCAP) and the International Trademark Association (INTA), it is projected that the global economic value of counterfeit and pirated goods alone will reach close to $3 trillion by 2022. Internet online shopping and cybercrime also present a threat to companies and consumers alike. It is expected that the financial costs from cybercrime will double from $US 3 trillion in 2015 to $US 6 trillion by 2021. On Free Trade Zones, Mr. Luna also emphasized that in too many parts of the world, FTZs are exploited on a daily basis by some to facilitate illicit activities that produce broader market reputational harm and put the physical security of many communities in danger. "The UAE has taken many positive steps to fight illicit trade," said TRACIT Director-General Jeffrey Hardy during his GTDW presentation. "But persisting vulnerabilities in the country's Free Trade Zones—including Jebel Ali, the world's 9th the world's ninth busiest container port—undermine achievements to date." On illicit cigarettes, with the Protocol to Eliminate Illicit Trade in Tobacco Products (the "Protocol") taking effect earlier this year, Mr. Luna encouraged countries to sign and ratify the Protocol to address the cross-border challenges posed today by illicit networks and to commit to be part of a global enforcement regime to tackle the illegal tobacco trade globally. Reinforcing the keynote by Minister Al Mansoori that new UAE laws will help to fight fraud and illicit trade, Mr. Luna stressed that "we can also learn from our UAE partners from their economic policies that promote innovation to modern and smart policing and enforcement that are innovative such as the UAE approach to cybercrime as Interpol Secretary Jurgen Stock underscored a few days ago in Dubai." "Through such collaborative efforts including here this week in the Abu Dhabi, we can do more together to combat illicit trade at all levels across global security landscapes." David M. Luna, a former U.S. diplomat and national security official, is the new chair of the Anti-Illicit Trade (AIT) Committee of the United States Council for International Business (USCIB) and is currently a Senior Fellow for National Security at the Terrorism, Transnational Crime and Corruption Center, Schar School of Policy and Government, George Mason University. He was previously also the President (Chair) of the OECD TFCIT; Chair of the APEC Anti-Corruption and Transparency (ACT) Working Group and APEC U.S. Coordinator for the ACT Pathfinder Initiative on Fighting Corruption and Illicit Trade; and Vice-Chair of the World Economic Forum Global Agenda Council's Illicit Trade and Organized Crime group.